70 • RV PRO • September 2018 rv-pro.com R V M A N U F A C T U R E R S Currently, the manufacturer has not yet determined if there will be a special pricing offered at Open House. 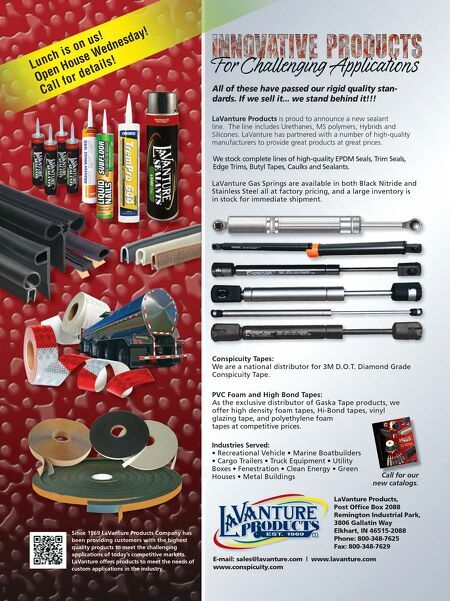 "We feel our pricing is very competitive with what's going on in the industry. Of course, being a small manufacturer, we can't get too crazy," he says, laughing. Currently, the RV maker has 20 dealers in its network and is looking to add more at Open House. Thus far, dealers have been reacting positively to the design, structure, and quality of the trailers, according to Dorton. It also doesn't hurt having a two-year warranty. "We're just anxious to be a part of the Elkhart Open House and showcase our products to the dealers. Hopefully they'll see the difference in quality and meeting the management of the company," he says. "We've got an awesome team of people that work with us. "We're a small company and it's going to stay small, as far as overhead. We don't need all the layers; we all wear multiple hats and do our best to bring a great product to the dealers with value and the best price possible," he says. "We want to make sure we're earning the dealers' trust and their business the right way." 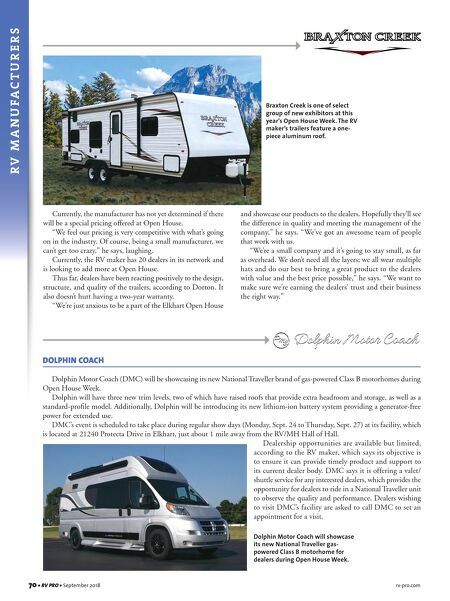 DOLPHIN COACH Dolphin Motor Coach (DMC) will be showcasing its new National Traveller brand of gas-powered Class B motorhomes during Open House Week. Dolphin will have three new trim levels, two of which have raised roofs that provide extra headroom and storage, as well as a standard-profile model. Additionally, Dolphin will be introducing its new lithium-ion battery system providing a generator-free power for extended use. DMC's event is scheduled to take place during regular show days (Monday, Sept. 24 to Thursday, Sept. 27) at its facility, which is located at 21240 Protecta Drive in Elkhart, just about 1 mile away from the RV/MH Hall of Hall. Dealership opportunities are available but limited, according to the RV maker, which says its objective is to ensure it can provide timely product and support to its current dealer body. DMC says it is offering a valet/ shuttle service for any interested dealers, which provides the opportunity for dealers to ride in a National Traveller unit to observe the quality and performance. Dealers wishing to visit DMC's facility are asked to call DMC to set an appointment for a visit. Braxton Creek is one of select group of new exhibitors at this year's Open House Week. The RV maker's trailers feature a one- piece aluminum roof. Dolphin Motor Coach will showcase its new National Traveller gas- powered Class B motorhome for dealers during Open House Week.